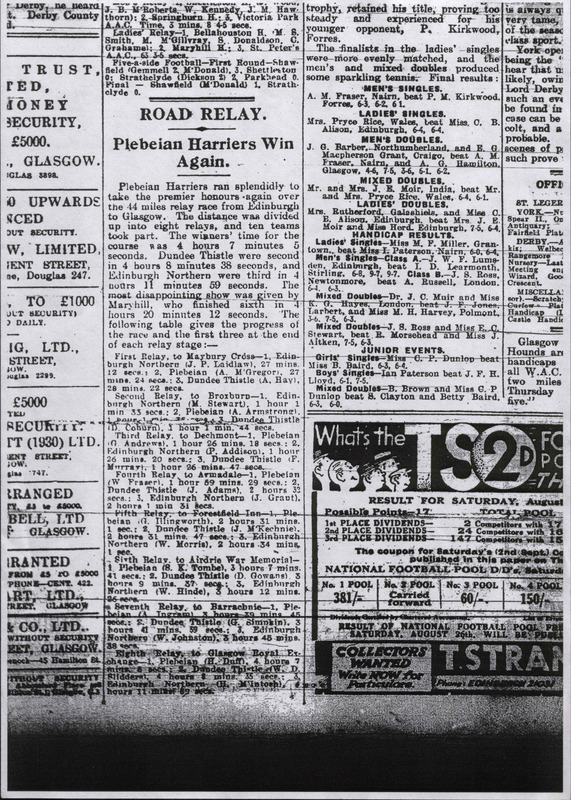 The Edinburgh to Glasgow Road relay was first run on the 26th April 1930. The race immediately became the premier club road race of the year consisting of 8 stages from Edinburgh to Glasgow following mainly the A8. It was last run on the 24th November 2002. After that a decision was taken to stop the race due to increasing traffic problems. In the 1930s the race was run in April and when it was revived after the War in 1949 the first race was held in April and a second one in November where it remained for the rest of its time. The 1937 Programme was inherited by Hugh Barrow from Andy Forbes and shows that a 4th place medal was presented as well as the first three and a most meritorious medal. This 4th place medal was discontinued in 1967. In 2003 there was one last attempt to continue the relay race on a route from Edinburgh to Falkirk but that had many of the same problems and was discontinued. The results are given here. In 2018 Alex Jackson started to trace the existing race reports & videos. They can be found on this page. Select the year to obtain the results. Select the year to obtain the programme.